Sacramento-based Michael Kollwitz (A.K.A. Michael K), is one of the most experienced and most active Stick players in the world today. This year alone he has played over 100 concerts and released a new CD, a new live concert DVD and a downloadable "greatest hits." collection. 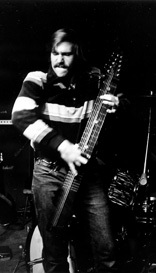 With a performing career that extends back to the early 1980's, Michael has been there practically since the beginning of the Stick phenomenon, picking up his first instrument in 1976 after seeing Emmett demonstrating it at a local college. Thirty years, hundreds of performances and ten releases later, he's developed his own distinctive style that's bright and engaging, winning over audiences with his affable stage presence, lyrical melodies and fiery solos. His repertoire draws from all directions, jazz, Latin, pop, classical and rock and roll. From his base in Sacramento, Michael frequently travels to art fairs, festivals and even airports, turning on thousands of new listeners to his own unique brand of Stick music. Michael's most recent release is his Live in Concert DVD. Recorded last summer in Sacramento, California, this 80-minute disc highlights what an accomplished soloist and entertaining performer Michael has become. For twenty tracks (and five costume changes) he alternately wows the crowd with driving upbeat grooves and then chills them down with soulful ballads. The list of tracks includes several originals, plus jazz standards like "Summertime", and "Black Orpheus," and rock classics like "Little Wing," "Nights in White Satin" and "California Dreamin'". 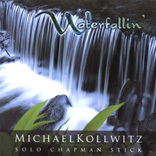 This DVD and his latest CD, Waterfallin' both feature the new Alto Stick, making Michael one of the first players to fully integrate its sweet high sound into his music. It's a natural progression for an artist that's always been willing to explore what's new in the Stick world and integrate it into his own art. Waterfallin', Michael's 7th CD, was released last April. His tasteful arrangements feature layered Grand Stick and MIDI synth beds with beautiful Alto melodies laid over the top on most of the tracks. You can read Jim Reilly's review of Waterfallin' from a recent Sticknews digest here: Sticknews #288. Michael is a busy performer. Check out his upcoming performance schedule here.